DCI's 2012 class of interns on the job. Exceptional opportunities are less than a semester away for college students looking for summer internships in a world-class professional environment. Drum Corps International offers hands on programs that enable students to use already acquired classroom skills in a fast-paced real-world setting. Internship positions offer students experience in a variety of disciplines including marketing/communications, sales, event planning, operations and information technology among others. Summer programs begin in May and run through the DCI World Championships in August. Students will work side-by-side with the full-time professional staff at the DCI headquarters in downtown Indianapolis, and help with the production of events across the country. 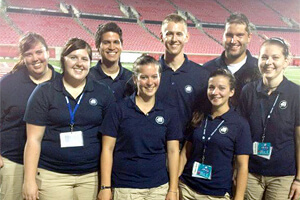 Join the Drum Corps International team this summer as part of our 2013 class of interns. The application deadline is Friday, March 8. Learn more about the DCI internship program, available opportunities and how to apply.